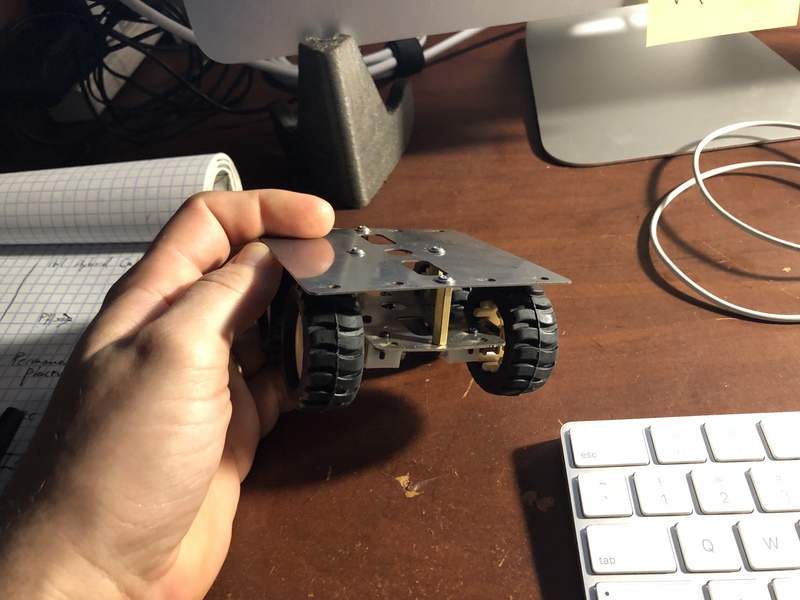 Not too long ago there was a post on Hackaday about a little four-wheeled bot made with a Raspberry Pi and some eBay motor drivers. 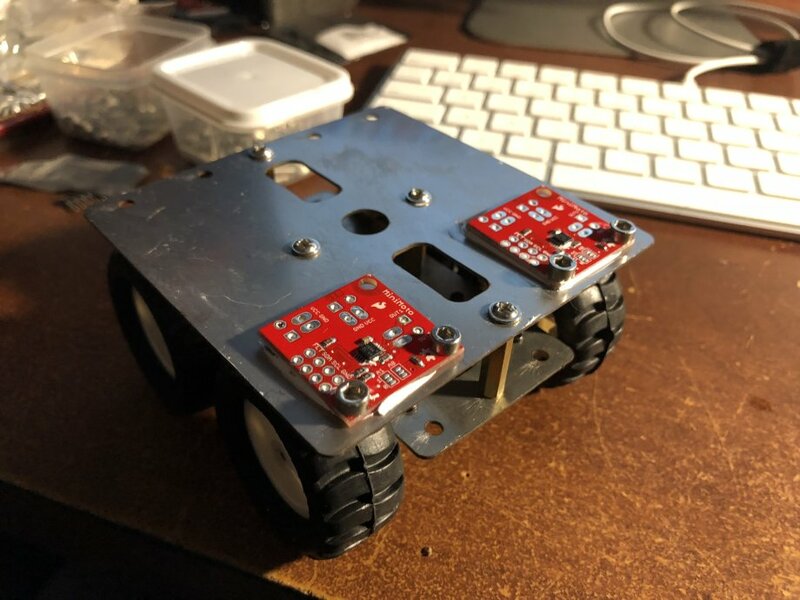 On buying the chassis I'd already decided to use one of my Raspberry Pi Zero W's (rp0w) to control the bot. I really like Arch Linux on the rp0w. It's light weight and the packages are well curated. Again, it's the little time savers. I liked the combination even more since I found a way to set the rp0w headlessly, which meant I could go from SD card to SSH'ing into little Linux board. Because Sparkfun did a great job of documenting the IC and creating an Arduino library to go with it. 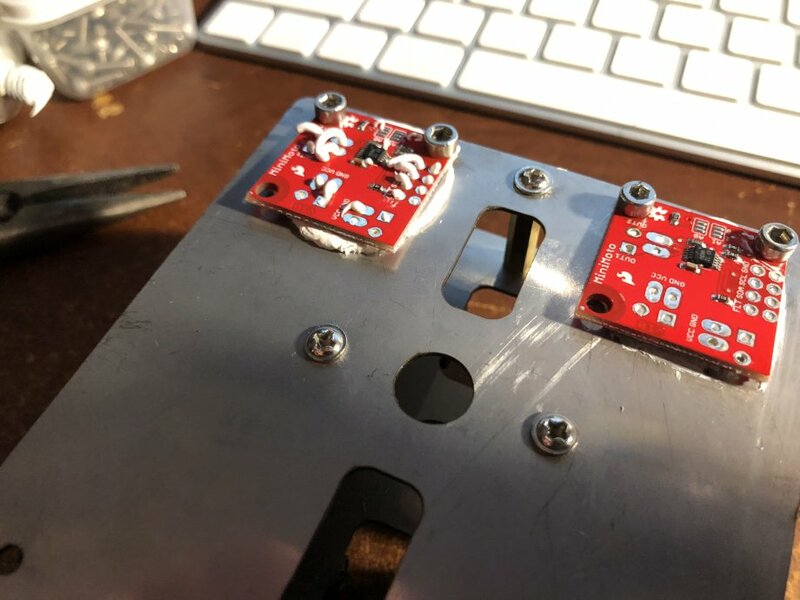 I was disheartened to find Sparkfun and EOL'ed the boards. Probably because buttholes like me kept buying them off eBay. I've got some mixed feelings here -- one of them is guilt. Anyway, I was surprised to find the mounting holes on the DRV8830s matched a set on the chassis. 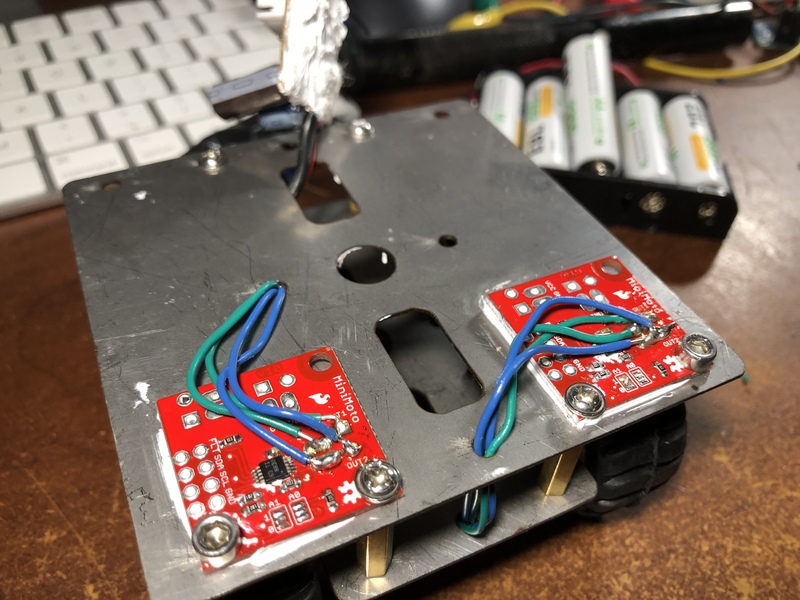 I decided to attempt using one module to drive two motors, thereby only needing two DRV8830 modules to drive the entire bot. I've had some thermal paste lying about for years--it works nicely as an adhesive. 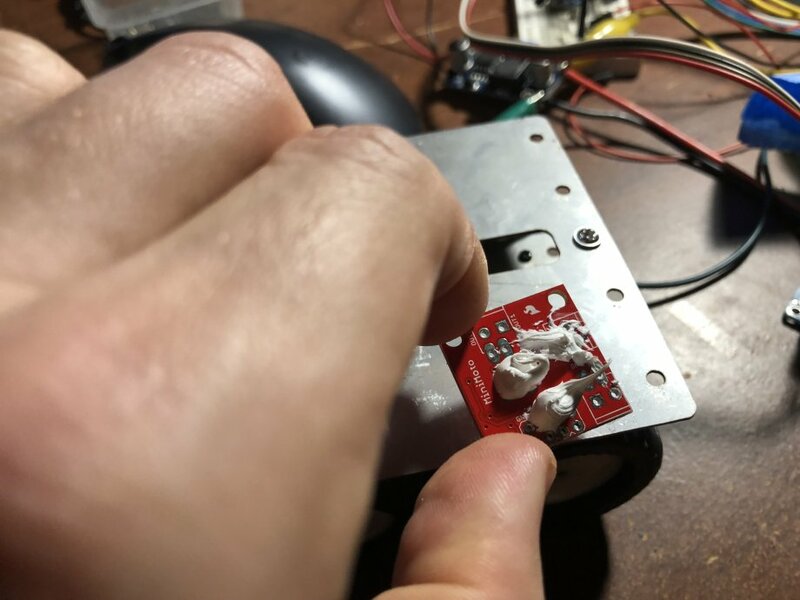 Also, I was hoping to use the chassis to heatsink the motor drivers. Ok, for these reasons I decided to build this bot using NodeJS. 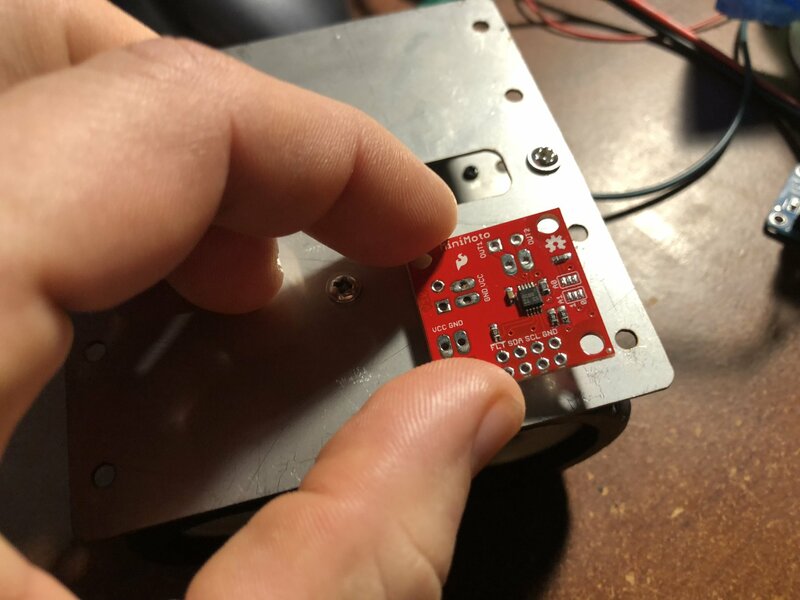 I've written a separate article on setting up NodeJS, working with i2c-bus, and porting the DRV8830 Sparkfun library to NodeJS. 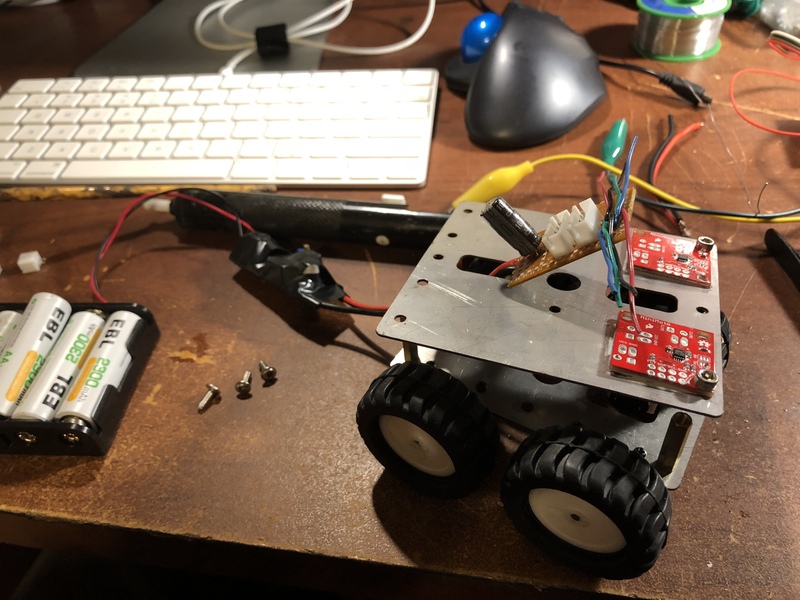 I drove the motor shown using two series Li-Ion batteries connecting to a buck converter set to output ~5.0v. 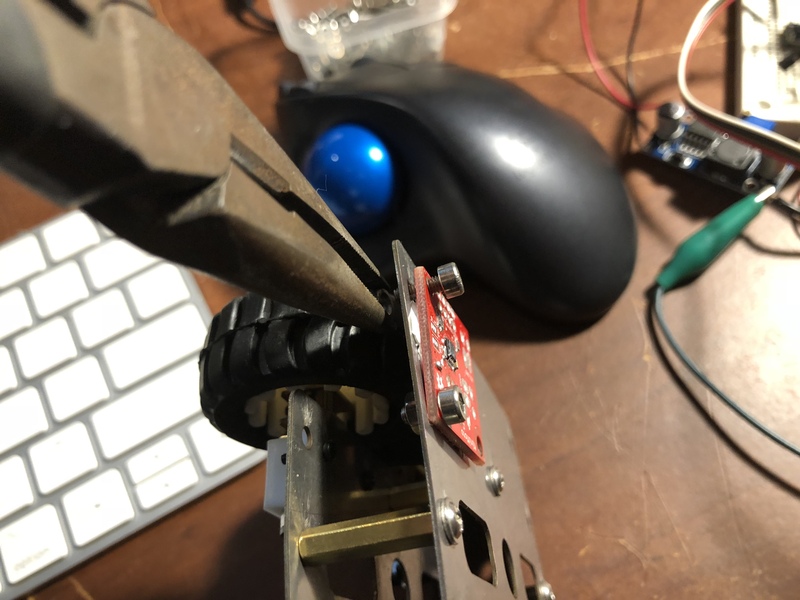 The motor spun nicely and pulled around 200mA. 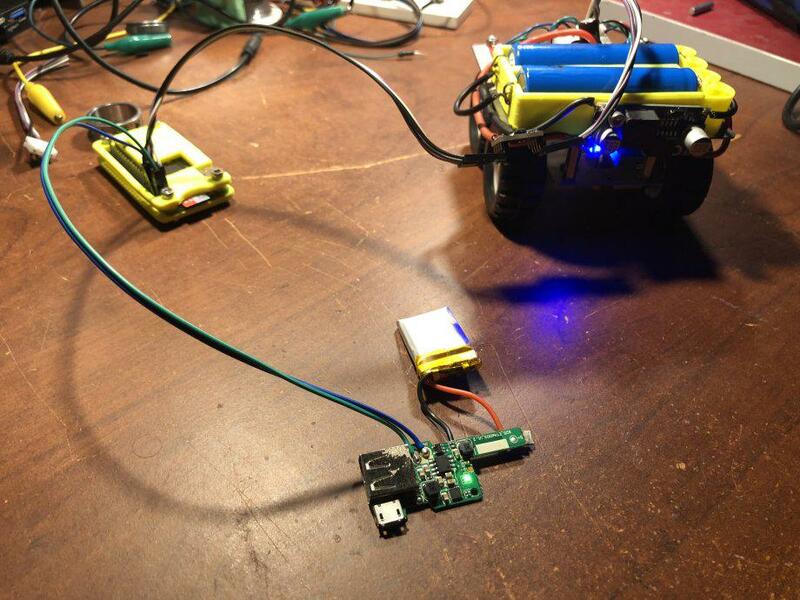 However, the real test would be connecting to _two_ geared motors per DRV8830. 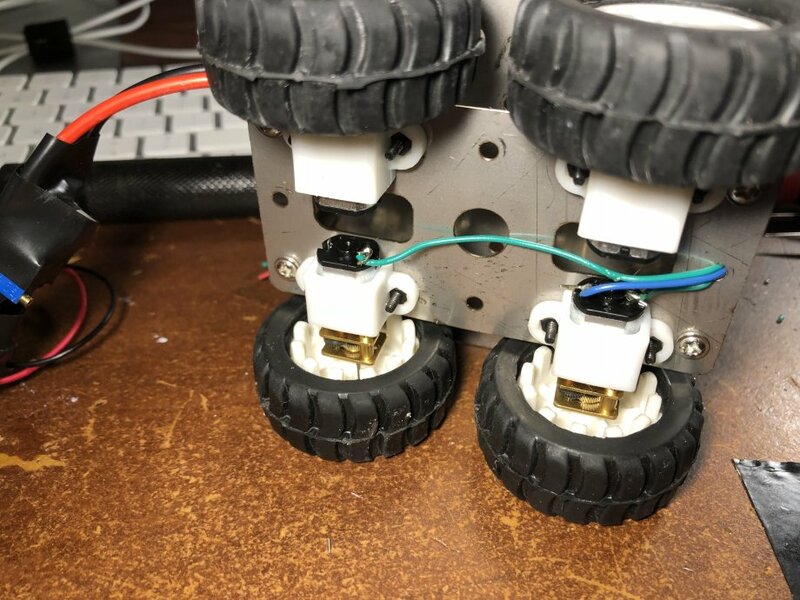 It was time to wire up the chassis motors and create a test of the system. The wire used was some eBay single core aluminum wire (the cheap stuff). Wiring was pretty straightforward. 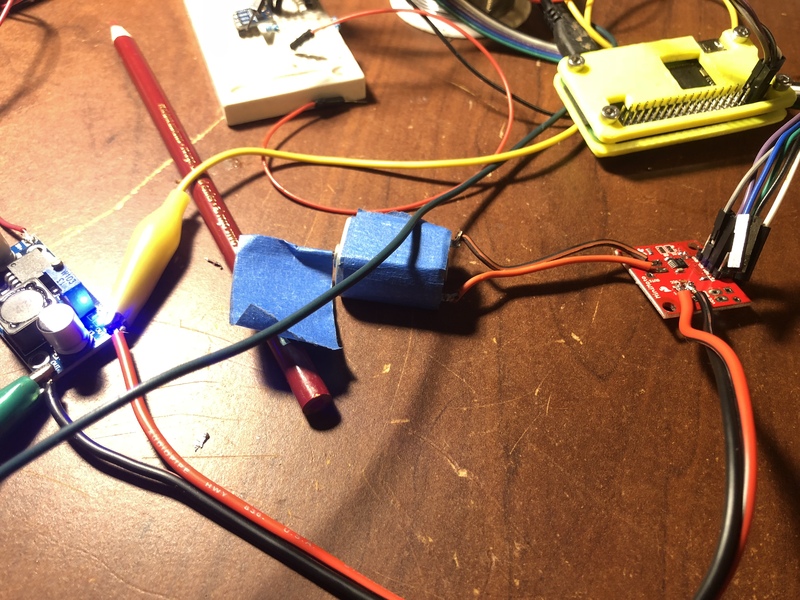 However, I did make a little i2c bus board from perfboard and JST connectors. Adding both ceramic and electrolytic decoupling capacitors for smoothing and to aid peak discharge. Note the heaping amount of heatsink goop on the underside of the perfboard, this was a hacker's solution to galvanically isolating the perfboard from the steel chassis. The last bit I had to figure out was the the Raspberry Pi's power. I attempted to use a single Li-Ion battery and a boost regulator to power it, but the regulator's I bought were DOA. The last bit I did for the video. I pulled the [code single]npm[/code] package keypress and wrote this little program. Then, I shot the following video and called it donesies. nice sir. great work , I like the 18650 battery holder. Thanks, Vis. Printed those awhile back and this was the first chance to use them. They are nice because it only takes wire and solder to get them going. 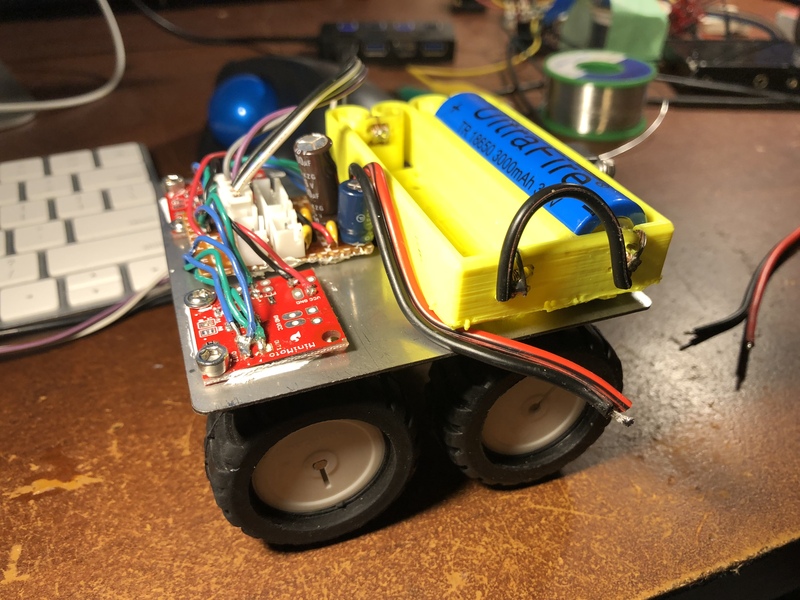 Okay, late to the party, but controlling a robot with NodeJS feels a little like getting a call from the boss on the weekend. I’m not surprised it was you that you made it work though. You’re Always full of resourceful surprises. Nice work Lad-good to hear from you last week! 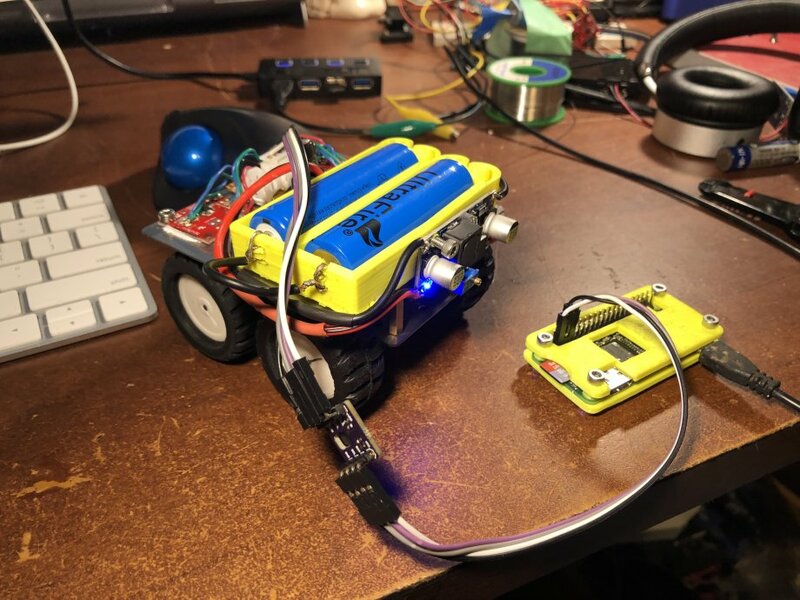 What software would you recommend for remote controlling a robotic vehicle via a web interface with a raspberry pi (web interface + camera stream) + arduino (hardware control)? I've tried/done this a couple of times but never found a decent solution. This looks like an interesting approach. Especially with so many platforms and options. Mainly I like the MQTT possiblilities for integration with my HASSIO home automation setup.